Showing you all the great food that you can find in Singapore! It was just another boring afternoon, where I was deciding on where to have my lunch. Once in a while, I would like to have my lunch at different places and try different foods. Just nice, I saw this special place called Timbre+ located at 73A Ayer Rajah Crescent. So, what's so special about this place? Well, this place is special as it's not only big (24,000 square feet), it also houses 35 different food stalls. This food place adopted the concept of repurposed graffiti-painter containers, therefore not only you are able to try different food, you get to see many different interesting "designs" too! The first food stall that caught my eyes after I parked my car was this fishball noodles stall. Not only they are hand made (as written on the board), there are various set which you can choose from too. After browsing through all the different sets, I decided to choose this (as shown in the above picture), it cost me $6.50, but I have to pay additional $1 (collect back the $1 after I returned my tray) which totalled up to $7.50. The noodle I ordered was mee pok and not only it comes together with the fishballs, there were also fried fish cake and fish skins as well. The drink they served was lime juice. It was delicious and fulfilling! It's a pretty great idea as this place was kinda busy during lunch hours, so if customers were able to self-returned their tray, the next customers will be able to enjoy a tidy and clear table. Overall, this is quite a cool place for me to visit and definitely I will come again to try other food as well. I was thinking of having early lunch as to avoid the lunch crowd at silat avenue. The reason is because every time during lunch time around 12 - 2pm, this place will be packed with people. Most probably they are all coming from Singapore General Hospital as it is very near to this place. When you walked into the "entrance" from the carpark (avoid the lunch crowd else you have no place to park! ), you will see this signboard hang on the pillar. When you walked inside, you get to see a lot of choices of dishes to choose from. After you walked inside the stall, it will be on your left side. Feel free to pick up one of the bowls and tongs to start choosing you favourite dishes. Once you have done that, proceed to the cashier and made payment. As simple as that! You can also choose the drink of your choice just right beside the place you choose your food too. As it was a very hot day, I choose to drink something that can "kill" my heatiness, which is the ginseng chrysanthemum tea. After a while, my food has arrived. I order mee hoon mee together with my dishes. These dishes are very crispy after they fried it. It was also very delicious if you ask them to go together with the chillies. Definitely I will recommend you guys to try it and for me I will also come again. But do always remember, avoid the lunch crowd. I don't want anyone of you to make a wasted trip here! So how much is the overall damage? Well, take a look at my receipt, It only cost you $6.20 including the drink!!! 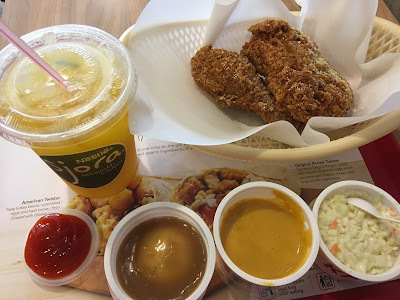 I have been wanting to try KFC hot and cheesy meal for quite some times. Just nice, this afternoon (19 July 2017) I happened to stop by at Boon Keng road and saw a KFC outlet. So, I decided to go in and try it out. Well, the KFC hot and cheesy chicken wasn’t as tasty as I thought. It comes together with the cheese sauce. If you are a cheese lover, probably you will love it as it contain a very strong cheesy smell. And if you are a spice boy or girl, you probably will love it too as it is quite spicy. Overall, I would probably give it a 4 out of 5 ratings. Have you tried it yet? Do let me know how you find the taste of this spicy cheesy chicken.